Tiramisu is undoubtedly one of the most recognizable Italian desserts in the world. Made of layers of mascarpone cheese and sponge fingers biscuits soaked in coffee and liquor tastes absolutely divine. I love it for its creaminess and coffee and cocoa flavor, but also, because it’s one of the desserts, in which I can use Marsala wine, which I truly love. Here’s my version of the dessert, adapted from The Australian Women’s Weekly magazine. Unlike the traditional tiramisu, this has been made without addition of eggs. Combine the water, coffee and Marsala in a shallow bowl. Dip the sponge fingers in the coffee mixture; place half of the biscuits side by side on the bottom of an 8 x 8-inch pan (20 x 20 cm) . Beat the cream, Dr. Oetker’s Whip and sugar in a small bowl with an electric mixer until soft peaks form, then fold into the mascarpone. Spoon half the mascarpone mixture on sponge fingers in pan. Smooth with a spatula or spoon. Sprinkle with half of the cocoa. Apply second layer of sponge fingers .Top with the remaining mascarpone mixture then remaining cocoa. * The original recipe didn't use Dr.Oetker’s Whip. 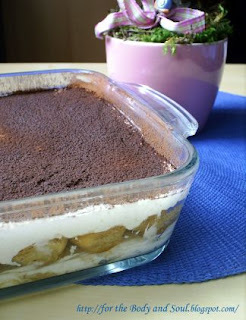 I added it to the cream to make sure my tiramisu would be firm enough to be served on a plate. If you prefer to serve your tiramisu in glasses, you can skip the Whip.